Millipore Guava PCA Personal Cytometer Counter w/ Cytosoft Requires Flowcell . New Life Scientific, Inc. 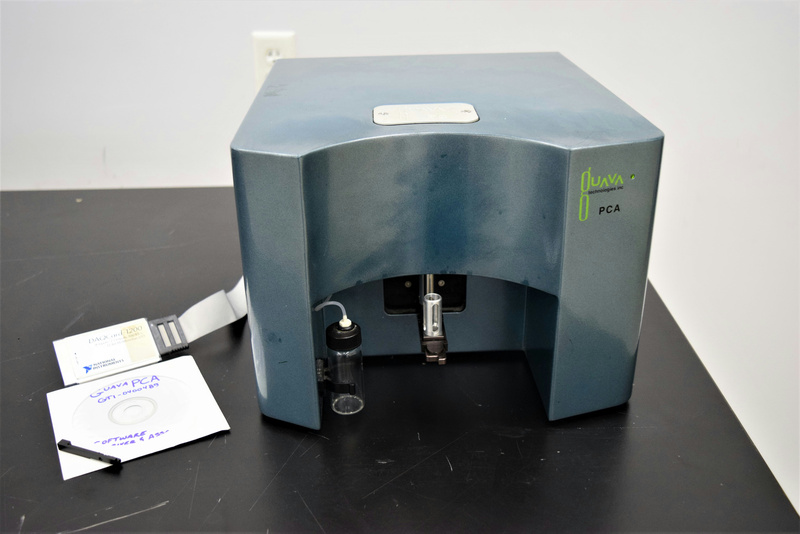 The Guava PCA flow cytometer is a benchtop instrument that allows the user to perform quantitative and qualitative analysis of 1.2-1.5 mL samples. This instrument features a green laser (532 nm), two color emission detection (580-583 nm & 675-680 nm), and provides reproducible results and processing procedures. This cytometer is ideal for analytical research applications, but it can be used in other disciplines. This Guava PCA was manufactured in August 2004 and displays some signs of age and wear on the paint and frame. New Life Scientific technicians test every Guava flow cytometer with differing bead concentrations and attempt to retrieve assay codes, often contacting Millipore's friendly technical staff for additional support. This PCA does not include a flow cell, but one was removed from a separate listing for testing purposes. The technicians were able to derive appropriate and consistent readings and confirmed that this instrument is fully-functional, but in need of a flow cell. The item includes a CD with Cytosoft 2.1 software for OS Windows 2000, the assay registration codes loaded on the software disk in a text file, and a National Instruments PCMCIA card driver. Please contact New Life Scientific for more information and inquire about the NLS ninety-day warranty. Some cosmetic wear, missing flowcell. Otherwise in good working condition.